All homes currently listed for sale in the zip code 91107 as of 04/18/2019 are shown below. You can change the search criteria at any time by pressing the 'Change Search' button below. "Absolute Unique Property in today's market. 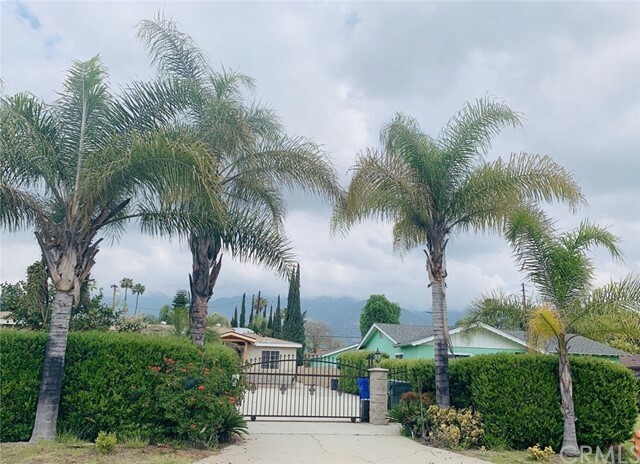 Right on the Border of Pasadena and San Marino, this Security Gated both from the street entry and property entry presents a Beautiful Home with Lovely Curb Appeal and a Near Acre of Complete Usable Lot. 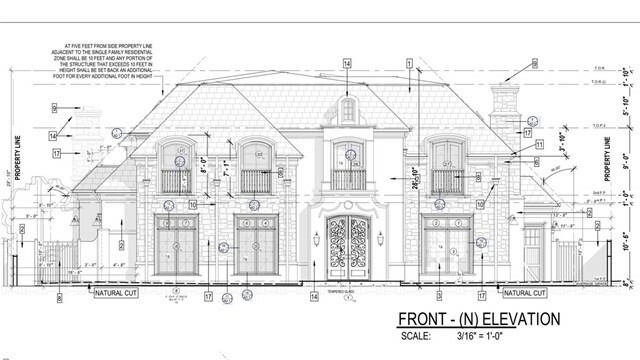 You Enter through High Wrought Iron Gate/Fencing onto a Circular Driveway that will fit around 10 Cars. Everything in the Spectacular Interior has been Totally Updated and Upgraded. Walk into the Entry and you have a Living Room to your left with Fireplace and Hardwood Flooring, Continue to the Hallway where you will See a Large Laundry Room, a Good Size Master Bedroom/Bathroom w/ Walk In Closet. All Rooms have Views of the Incredible Yard. To your right you have another Bedroom and Guest Bathroom. Go Further into the Home and you Enter a Formal Dining Room with Large Light Fixture that can Accommodate Large Dining Parties, next into the Most Beautiful Family Room with Fireplace and Large Wet Bar w/Lit Glass Cabinets that can handle at least 5 Bar Stools, Beautiful Flooring, Recessed Lighting and Views of the Pool/Spa/Cabana. The Gourmet Kitchen has Everything you Need/Desire for Formal Events or Casual Get Togethers, Stainless Steel Appliances, Large Island, Double Lit Pantries, and Breakfast Area for your Morning Coffee. Upstairs are Two More Bedrooms including the Magnificent Master Bedroom/Bathroom, Large Shower, Self Standing Tub, Walk in Closet and a Fourth Bedroom/Office. Rear Yard is too much to believe. Pool/Spa, Cabana"
"Built in 2005, this elegant and romantic estate is located in prestigious, gated Kinneloa Ridge Canyon & is nestled on 27,000+ sq. ft. lot w/ stunning city, canyon and downtown LA. views. This idyllic light filled residence is adorned with custom designed appointments, Venetian plaster, impressive inset ceilings & modern luxuries that exudes comfort in its exceptional floor plan w/ formal & public rooms perfect for grand-scale entertaining. The impressive foyer w/ soaring ceiling showcases elegant formal living & dining rooms., expansive family room w/ arched windows, scenic view, Onyx fireplace & a cozy den w/ Bar & fireplace. Designed to impress, the Chef's kitchen boasts custom cabinetry, center island, Thermador appliances, large pantry & breakfast area leading to the serene patio & garden providing perfect outdoor ambiance. 2 lavish master suites (one on 1st floor), luxury master bath w/ dual sink, Jetted tub & vanity, library(could bet he 5th Br. ), 3/4 Ba., 2 additional en-suite Br., office/nursery by the master Br. & 2nd floor lounge, leading to the balcony w/ fantastic views completes this superb home. Other features include recessed lightings, large laundry room, 3 zoned HVAC, 3 GRG, security camera & built-in sound system & fire sprinkler System"
"Built in 1927, this classic Sylvanus B. Marston French Norman, revival-style home features 6-bedrooms and 6-bathrooms on over a half-acre of forested privacy. 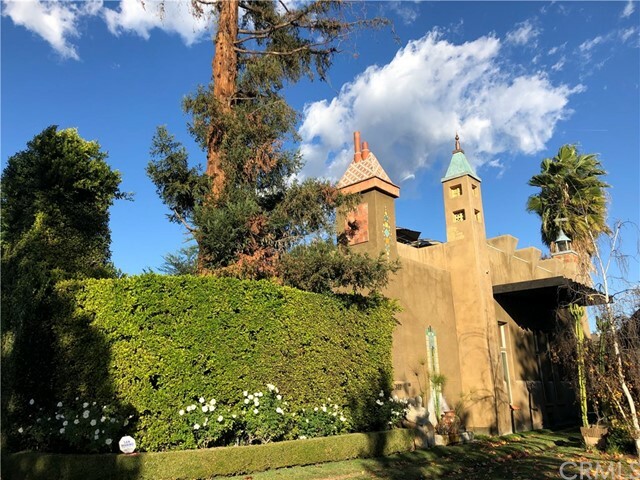 Located in the heart of the prestigious Caltech Huntington Library district of Pasadena, this historically and architecturally significant property boasts a romantic country Norman-style turret and double-wide frontage. Built during Pasadena's Golden Age, the home has an elegant estate-like presence, featuring distinguished public rooms, 3-fireplaces and many examples of the French Normandy period including a grand entry with a circular sweeping staircase, a lovely garden solarium overlooking the pool, plus a formal floor-plan offering both elegant entertaining and comfortable living. Enhanced by original house fixtures, a circular drive, motor court, a charming 1-bedroom and 1-bathroom guest house with a full kitchen and attic, and a 4-car detached garage, this Marston architectural gem offers a prime location to custom-create your dream house." "PRICE REDUCED! 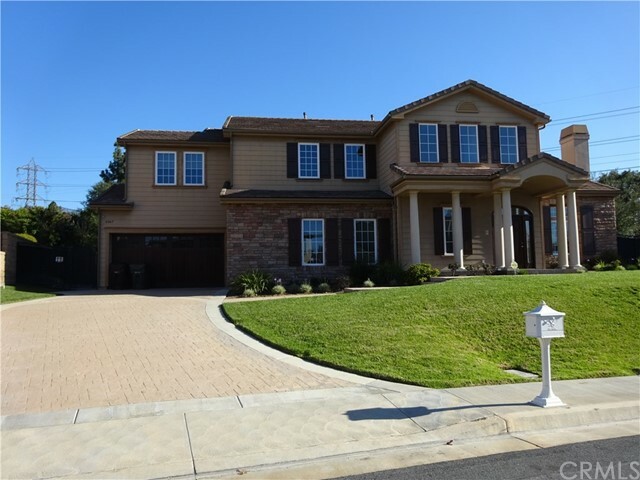 Spacious and luxurious estate in a rare gated community within the SAN MARINO School District! Built in 2009, this modern home is MOVE IN READY. There is wood flooring throughout the house & exquisite tile work in the kitchen & bathrooms. Downstairs, there is one bedroom suite for a total of five bedrooms. A formal living room with a fireplace & a formal dining room for all of your entertaining needs. An elegant chandelier graces the home. The family will enjoy the open kitchen area with space for in kitchen dining with a large center island, a walk-in pantry, ample cabinet space, pendant lighting & stainless steel appliances that a modern home deserves. The family room has a cozy fireplace which overlooks the backyard with its sparkling pool & spa, spacious yard & play area for the whole family. The upstairs master bedroom has plenty of space & natural lighting; the master bathroom has dual sinks, a soaking tub, a separate shower & a walk-in closet with built-ins. Three additional spacious upstairs bedrooms have private bathrooms. A large laundry room & three car garage round out this home!" "100% BRAND NEW CONSTRUCTION homelocated in prestigious Pasadena neighborhood, designed by Carl Anders Troedsson. Stunning & beautiful Spanish masterpiece built with uncompromising attention to detail with elegance & sophistication. Finest materials, craftsmanship, design in inviting floor plan. There are hardwood floors, recessed lighting & decorative archways. Formal Living Room has beamed ceiling, fireplace & built-in cabinets, adjacent is Formal Dining Room. Masterfully designed Kitchen has stainless steel appliances; 48' Sub-Zero refrigerator, 48' Wolf appliances; range, hood, microwave & Asko dishwasher. Quartz counters, farm style sink & breakfast bar. Family Room has fireplace & French doors leading to covered patio area. Completing 1st level is guest room, full bath & den/office. 2nd level has 3 ensuite bedrooms, including grand Master Bedroom with large bath, walk-in closet, fireplace, built-in cabinets & beamed ceiling. French doors lead to private balcony. Laundry Room is off the 2nd floor Hall. All finishes & appointments are masterfully done. Baths have Moroccan style tile floors. Garage has custom all-wood door & French doors open to private backyard & bath off patio. Opportunity for discerning buyer with the best in Pasadena living." "An impressive estate unlike any other, exuding the highest quality & design.This beautifully modern home is situated most famous gated commuinty North Kinneloa Ranch in Pasadena, designed by Craig Edwards. This contemporary 4 beds, 4 baths features high ceilings and a spectacular floor plan. The main level includes an en-suite bedroom which owner converted it as an office, beautiful seating area with fireplace, a spacious dining room, a professional kitchen with island, double dishwashers, KitchenAid side by side refrigerator. The kitchen opens to a large family room with fireplace and stack back doors out to the fabulous backyard with a gorgeous pool and jacuzzi perfect for enteraining. The grand staircase leads you to a living room with a patio overlooking beautiful city view.The master bedroom offers two seperate walk-in closet, and a beautiful master bath with a free standing shower and seperate spa tub.Fine crafted natural architectural elements include: polished & stained concrete flooring, steel beams, copper eaves chimney surround & downspouts, custom staircase railings, indoor and outdoor surrounded sound speakers & stone baths. Open floor plan, saltwater pool, spa, gym, professionally landscaped yard, & oversized 3 car garage w/ glass paneled doors. 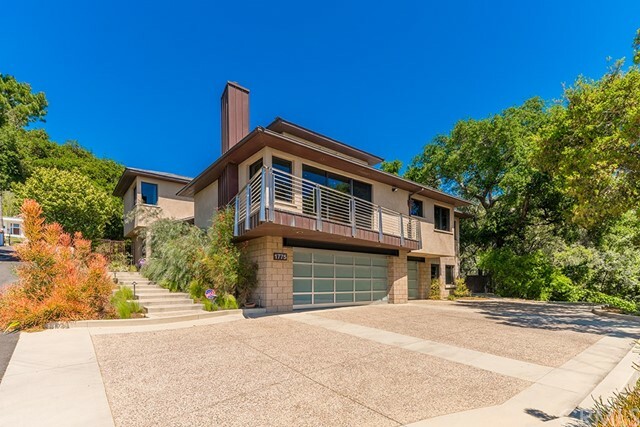 This home features stunning mountain view, city view and fireworks performance on July 4th. Come live the ultimate fascinating fairland lifestyle in this luxe modern home!!!" "Wow a million dollar home surround this location dont miss this golden opportunity to build you dream house on one of the famous street in Pasadena & San Marino School District area lot size is 78X190.5,we have a plan already been approval by city could build approx. 5000 sqft living area with 5 suites including one master suite on first floor this is a one of a kind can built a brand new home without any hesitation considerate not much new house in this area &only cost less than 4 mil can own your California dream home with luxury life style just bring your hammer and could complete within a year to move right in!" "This elegant two story 1926 American Colonial is located in the sought after Caltech/Huntington Gardens neighborhood. Flanked by spectacular mature trees and located on a beautiful street. A few of the classic exterior features include a symmetrical front with a central door, sidelights, and a traditional fanlight surmounting the oversized front door. A traditional central hall floor plan with staircase, and spacious foyer greet you as you enter the 4 bedroom house. Formal living room with handsome fireplace, crown molding and an abundance of windows that provide natural light throughout, open to a family room with built-ins and French doors that accesses a deck, fountain and grassy area making this the perfect area for entertaining. Breakfast/day room with built-in cabinets is adjacent to the remodeled state-of-the art kitchen featuring marble counter-tops, center island, built-in desk and French doors to the deck and barbeque area. Built in cabinets throughout including the Butler's pantry. Formal dining, family and powder rooms complete the first floor.Upstairs are four spacious bedrooms, one with a balcony and mountain vistas & two bathrooms. Located in the award winning Hamilton Elementary School district, Caltech & So. Lake." "You read it right! NEW PRICE for nearly 6,000 SF on a HUGE LOT and we're listening! Check this incredible value then run, leap, race over to Michillinda Park to visit and WRITE YOUR OFFER!! It is an amazing value! This place is built for your family and the generations to come. Two comfortable master bedrooms, one on the ground floor, accommodates guests and the older members of the family. An executive-style office is situated to command your holdings. Immaculate grounds, nearly a half-acre, with a pool and outdoor dining area invites all your guests to wander out, then wrangle them back in for wild tales at the magnificent bar. Serve them bites from the large kitchen. Your success was built by taking advantage of opportunity. Here it is! Bring your offer and we will present!!" "It was custom built in 2007 like a modern castle. You have to come to appreciate its unique and one of kind. It is on quiet street yet close to everything including California institute of Technology, Pasadena City College, Supermarkets, Langham Hotel, Rose Parade Colorado route , Huntington Library and many others. 3 suites front house and 1 bedroom and 1 bath guest house at the back. Just north of San Marino city. The back independent 680 sqf guest house is leased at $2300 per month. Roof top garden with hot tube and the Mountain View. Wonderful to have party on top of the world with clear views all directions. Suntan or breakfast in fresh air? Come down to back yard to swim in saltwater pool with water falls. Front yard passcode gated and surrounded by 16 feet hedge. Huge front covered porch with fireplace to welcome you home. Back yard is also guarded by remote control iron door. Open kitchen with 2 built in subzero refrigerators, professional cooking stove, microwave and sink. Laundry room built in washer and dryer. Too many drawers to hide away things. Skyline all over the house to bring in natural light. All room with speaker to broadcast music. Everything is ecological proof and environmental friendly. Each bedroom is special designed and with own bathroom. Master bedroom has its own fireplace. The shower comes with steam bath too. The window door over looking the pool. Move in and enjoy soon." "Welcome to this re-imagined home located off a private cul-de-sac with the San Gabriel Mountains as a stunning backdrop. Situated on nearly an acre of gated, newly installed lush landscaped grounds that offer multiple patios, a pavilion and shaded trellis plus a pool, spa and guesthouse/Granny Flat with its own private entrance (legal ADU), both the main house and the guesthouse have been thoughtfully remodeled and upgraded with new gourmet kitchens and baths with custom cabinetry, tile work, lighting and plumbing fixtures and state-of-the-art appliances. Upgrades include newer plumbing, gas lines, hardwood flooring, newer windows & doors, central vacuum system, painting throughout, HVAC system, water heaters, two fireplaces with custom tile work, a newly completed and beautifully finished ADU and so much more! The easy flow, elegant design and oasis like grounds make this home an entertainer's delight." "Exquisite New Architectural Homes in Pasadena. A lovely new community is emerging in Southeast. Pasadena, surrounded by magnificent preserved oak and deodar cedar trees. Built in 3 phases, the sixty Mediterranean-inspired homes of Town & Country will embody the luxurious California lifestyle.Within, warmly elegant interiors are filled with dappled sunlight. Broad arched windows and French doors look out on leafy, picturesque courtyards. Old World details add subtle visual richness, softly accented by recessed lighting. European style kitchens are appointed with stainless steel appliances. Each home features double-paned windows, quality doors, multi-zone AC, and optical fiber by AT&T. Here, youre amid the best of Pasadena, moments from The Shops at Lake Ave."
"Dramatic, custom-built, one owner Mid Century Modern offering expansive valley views of hillsides, downtown Pasadena and Los Angeles, and on a clear day, Catalina beyond. Designed with a Japanese influence and for entertaining, this one-of-a-kind home offers high ceilings, expansive walls of glass, newer paint, carpeting, copper plumbing, roof, and HVAC. Restored in 2017/18 with sensitivity to the home's original architecture. Large living room with marble faced fireplace and 12 foot ceilings opens onto a deck. Formal dining with wood built-ins and restored hardware. Generous-size kitchen with center island, sub-zero 36 ref. and 36 in freezer, ample storage and counter-tops. Family room. The original baths have been restored including a sunken tub in the master with a private outside garden with new Bamboo privacy surround. On the lower level is a 3rd bedroom or guest suite with a Bouquet Canyon Stone fireplace and full bath. Large direct access two car garage. This special homes offers tremendous privacy and rests on over a 1/2 acre dramatic view parcel. Very Special!!" 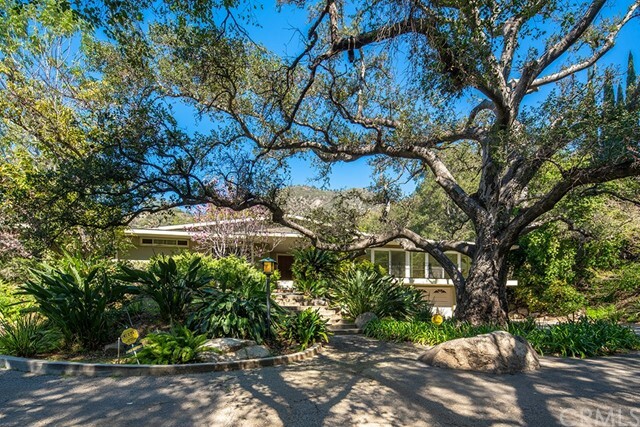 "Stunning Beautiful Mid-Century Single Level Executive Modern Home Was Designed By Architect, Arthur C.Swab, In 1961, Who Was Specialized In Wooded Natural Setting. Discover This Kinneloa Mesa Treasure Of Gracious Oasis Just Minutes From The Eaton Canyon Golf Course And Hastings Ranch Shopping. 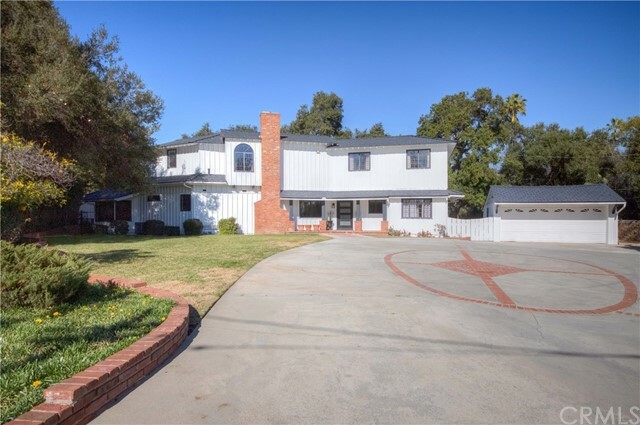 The Home Is Light & Bright Sits Discreetly On An Over 20,000+ Sqft Lot With Complete Privacy And Nestled Amid Towering Oak, Eucalyptus And Pines. With Spacious Rooms Including Formal Dining Room And Comfortable Family Room With Wood-Burning Raised-Hearth Stone Fireplace, 4 Bedrooms And 3 Bath Rooms On The West Wing Along With Separate Entertainment Rooms. Walls Of Glass, Vaulted Ceilings, Clean Lines, Open Floor Plan And In The Huge Back Yard, An Oasis Of Privacy, Beautifully Landscaped, With Pool & Spa, Patios To Lounge & Dine. 3 Car Garage Attached With Interior Access, Enjoy Quiet, Privacy In This Unique Natural Setting!" 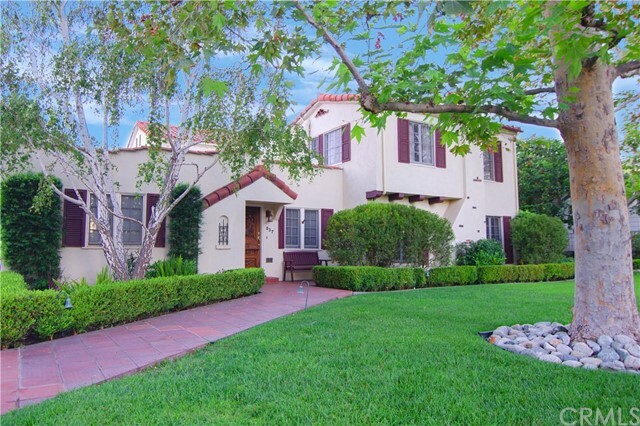 "Completely remodeled Spanish Traditional home in the sought after Cal Tech area of Pasadena. Every aspect of the home from the structural retrofitting, the framing, the chimney, electrical wiring, central air and heat, the roof, the salt water pool and jacuzzi just to name a few- all BRAND NEW. This home is nestled within a beautiful tree lined street with wide side walks that is perfect for morning or evening strolls. Walk inside and you'll feel right at home with an original Batchelder fire place to greet you and a dining area that opens to a gorgeous kitchen filled with Viking appliances that will compliment any chef. You'll find three bedrooms along the hallway that will lead you to a spacious family room complete with a wall to wall wet bar and wine refrigerator. Each room features black out shades for privacy. Huge cantina doors open to the luxurious backyard that makes you feel like you're in a private resort. It's a bonafide entertainers delight equipped with a fire pit, custom built saltwater pool with jacuzzi and pool house that features a 3/4 bath. This home has too many features to list and it is a MUST SEE. A truly complete transformation with modern amenities while retaining its Spanish charm. (Virtual tour available)"
"Located in the desirable Chapman Woods neighborhood, this newly constructed custom home is stunning from the front door to the lush back yard. The elegant sunlit rooms feature soaring ceilings, gorgeous moldings, gleaming hardwood floors and custom-built cabinetry and a state- of-the-art gourmet kitchen. A warm and sophisticated home perfect for entertaining!Highlights include:*Formal Living Room with gas fireplace*Formal Dining Room with rotunda ceiling*Family Room with custom entertainment unit & wine bar*Gourmet kitchen with Viking appliances*Master Bedroom with custom shelved walk-in closet, desk area and luxurious en-suite bath*Dual zone heat/air with individual temperature controls in the bedrooms*Pre-wired for indoor/outdoor sound speakers & ADT security system*Two car garage with direct access to home *Lush landscaping with automatic sprinkler"
"Tremendous value opportunity in Pasadena beautiful Michillinda neighborhood! Brimming with potential, this private and spacious Michillinda-area home is a fantastic opportunity not to be missed! Newly built 5 bedrooms 4 baths including 3 suites. The functional kitchen boasts granite counter tops, recessed lighting, and wet bar. Huge private courtyard with automatic iron gate?The house is under renovation. It is city approved and will be need partial interior renovation." "This exceptional, sophisticated mid century home is located down a private drive on a deep, level lot. The attractive custom paved circle leads to a gracious double door entry, unusual quiet and privacy in a desirable neighborhood. Built around an inner courtyard terrace and pool accessible through French doors in all the public rooms, ideal for indoor/outdoor entertaining. The floor plan presents a spacious living room with working fireplace and a formal dining room both across the front of the residence. The west wing consists of a generous bedroom suite with bath and an extensive master with oversize walk-in closet, luxurious bath and two walls of glass and French doors overlooking the garden. On the east side is the updated gourmet kitchen with granite counters, greenhouse window, pantry and built-in desk and the third bedroom suite which is currently used as an office / family room. Mature trees and plantings provide a special landscape for the park like grounds. Features include hardwood floors, skylights, cathedral ceilings, updated baths, a two car garage and much more." "A Harold Zook, FAIA, designed Mid-Century Modern perched on nearly a 1/2 acre of level grounds with dramatic City and mountain views. 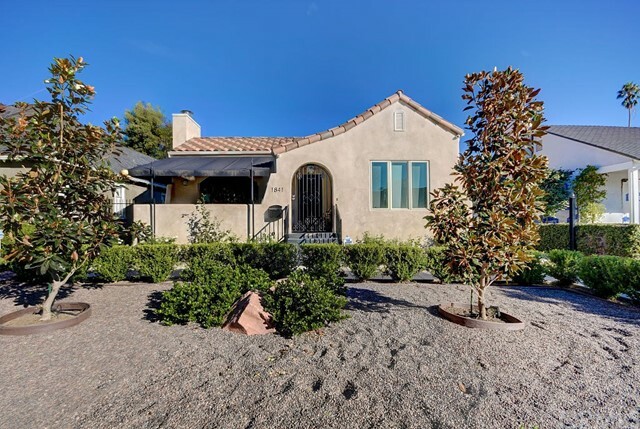 Extensively remodeled in the last several years with newer systems, this gated property incorporates the outside living areas into the home's internal living space. The home is well sited on the parcel with expansive walls of glass offering views from every room and the separate outside living spaces. A gated entry courtyard offers mountain views, a remodeled pool, separate built-in spa, fountain, built-in BBQ area, and paver tiled patio. Double doors lead into the generous sized and light filled living room with Bouquet Canyon Stone fireplace and views to the mountains and downtown Pasadena and LA beyond. The light filled kitchen has been updated with newer appliances and wall of glass with mountain views. Adjacent to the kitchen is a den with original painted stone wall. In one wing of the home is a 4th bedroom with full bath and walk-in closet. 3 bedrooms and 1 3/4 baths are located in a separate wing with views from each room. The 3/4 bath provides access to the rear yard and garden. The property offers a very romantic and private setting with exceptional placement of windows t/o."